Fifty years before Kermit the Frog invaded Broadway with pigs, rats, and chickens, poet and puppeteer Yosl Cutler regularly performed comedic tragedies with his Yiddish-speaking menagerie. At the beginning of the twentieth century, half a million Yiddish-speaking Jews lived in New York's Lower East Side. Second Avenue, known as the "Jewish Rialto," served as Yiddish speakers' Great White Way. Cutler, perhaps better known as a cartoonist for a Jewish Communist newspaper, often depicted scenes of social injustice. Simche and His Wife, a musical comedy about a couple getting evicted for not paying rent was wildly popular at the time. In this miniature musical comedy, Simche sings about how he lost employment as a locksmith, then lost his job as a clothing presser, and couldn't pay the rent […] their cheerful references to the rent protest are so fleeting that modern spectators probably would not know the Council was a Communist-led organization. At first he was merely spoofing. With childish delight he invented topsy-turvy worlds, peopled Heaven with the most absurd and grotesque beings and turned the traditional religious lore into droll and very irreverent nonsense. His funeral was attended by 15,000 comrades. 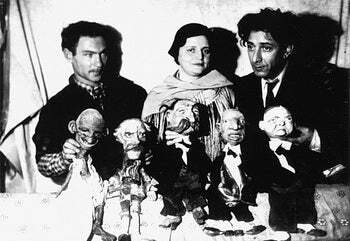 The original eighteen-minute puppet film was recently restored by the National Center for Jewish Film.